You are here: Jake's Bones > Does anyone know what this is ? Does anyone know what this is ? I found it yesterday in a new wood I was exploring which is very remote and no-one has been there for years. It looks almost like a skull, but it couldn't possibly be, could it ? Is it some kind of strange rock ? See what you did there.. 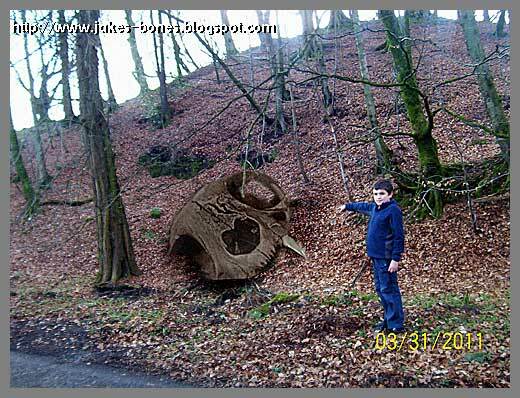 It's a rare skull of the giant mammoth Aprilis Follis, that sometimes turns up at this time of year! Good one. Bubo giganticus April foolia. Brilliant! Well done Jake. Its a Giant Sabre-Toothed Tortoise. Chelonia globus probably a juvenile of the adult that carries us through the universe. Thanks everyone ! I went back the day after April 1st but strangely it has disappeared ! Now that I think about it it looks a lot like my cat skull ! Otters are really cool but you are not allowed to keep their bones in Scotland unless you have a special licence. If the skull was too big to be an otter, could it be a badger ?